Die alte Tante BBC hat einen Disability Podcast gestartet. Großartig! Der Schauspieler Mat Fraser und Comedian Liz Carr machen heiteres Berufe– Behinderungs-Raten und philosophieren über Sinn und Unsinn von Behindertentoiletten-Schlüsseln. 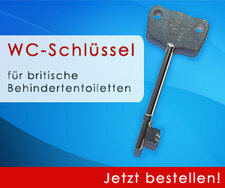 Für Leute, die britischen Humor mögen, sehr nett anzuhören. Many thanks to Katja from Colorado/USA, who made it possible that travellers with disabilities from US know, where they shouldn’t arrive in Germany – in Dusseldorf. She translated my blog entry (see below) into English. Don’t miss her weblog! 1000 Dank an Katja aus Colorado/USA, die dafür gesorgt hat, dass auch behinderte Reisende in den USA wissen, wo sie besser in Deutschland nicht laden – in Düsseldorf. Sie war so nett und hat meinen Eintrag ins Englische übersetzt. Übrigens ist ihr Weblog sehr lesenswert! Yes, I think it’s outrageous, too. But that’s exactly what you do. Not to passengers who have shoes, but to wheelchair users. You don’t return their own wheelchairs to them at the plane. No, no. You seat them in an airport wheelchair. And in this they have to get to the baggage claim, that is to say, they have to allow themselves to be pushed. Because the wheelchair is so bad, that only a very few are actually able to move themselves. You’re not interested in the fact that things work very differently at the more than 40 airports I’m familiar with world-wide. A wheelchair is a wheelchair, you think. But that’s not true. Health insurance pays less and less, but one thing they do pay for: custom-fitted wheelchairs for disabled people who need them. And why is that? Because the health insurance companies, unlike you, have grasped the fact that custom chairs prevent pressure sores and many disabled people are only able to sit up properly in their own wheelchairs. For many, it’s painful and uncomfortable to sit in a wheelchair that doesn’t fit them. There is a difference between those who can’t walk far due to age and those who have spinal cord injuries, MS, or other problems. You, however, explain to me, that all this is due to safety considerations. Very interesting. Where is the safety risk in bringing my own wheelchair, which has been in the airplane from Hamburg to Duesseldorf the whole time, to me at the gate? Do you honestly believe that someone could have decided to fly from Hamburg to Duesseldorf with explosives in her wheelchair in order to blow up your beautiful airport? One of your employees, when confronted with this question, replied, “But then we would have to carry it up the stairs.” Yes. You would have to do that. They do that at thousands of airports all over the world. I am confident, that your employees could manage it as well. But you have something, that many other airports don’t – elevators that go up to the gates. In fact, you could take the wheelchairs up in them. “But what about check-in?” I hear you say. Do you know that your colleagues in Hamburg, Munich and elsewhere have these cute little vacuum cleaners? They use them to vacuum the wheelchair, put the dust under a microscope, and confirm for themselves that I’m not sitting on explosives. It takes a whole two minutes. Why can’t you manage this like everyone else in the world? Why do you make your disabled passengers shuffle to the gate in size 13 slippers? Have you ever heard of laws against discrimination against the disabled? Or of the new EU rulings that give the disabled more rights? No? Well, fine. My lawyer will be enlightening you. Perhaps then you’ll appreciate why it’s unbounded cheek to take my wheelchair away. Ich habe meine Disability Blogroll ergänzt. Mehr als 100 Blogs und Nachrichtendienste sind dort jetzt gelistet.